Taco Deli has gotten so popular over the years that I hardly ever go there any more, it’s too busy! The best thing about the #tacocleanse is that it has gotten me out of my taco comfort zone in an attempt to eat all the tacos. Today’s tacos were some of the best I’ve had to date, the Freakin’ Vegan on top has just beans, pico de gallo, and avocado and yet it is one of the best tacos in town. Their refired beans are fabulous, smooth and creamy in texture, and their corn tortillas are perfect. I also had the Papadulce described as “Oven roasted sweet potatoes (camote), grilled corn, roasted peppers, caramelized onions, toasted pepitas & a chipotle camote sauce”. It tasted like fall even though the temperature is still getting to a hundred degrees most days. I didn’t know until recently that their awesome Dona salsa is vegan too so make sure to load up when you go. This entry was posted in Austin, Austin Restaurant Reviews and tagged #tacocleanse, Austin, Taco Deli, tacos, vegan, vegetarian on September 18, 2013 by lazysmurf. I want that place to just drop right down in Raleigh one day. YUMMM! camote and caramelized onions?! yum. Man, this is a beautiful plate of tacos! 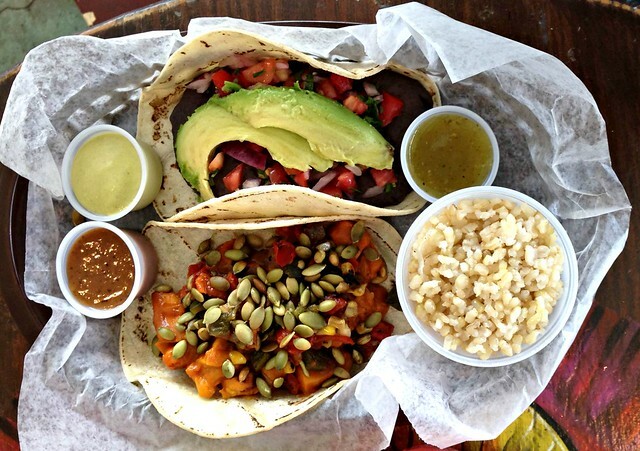 I’ve never seen toasted pepitas on tacos, but what a perfect taco plate for the fall season!